Kim Jae-joong (Hangul: 김재중; Hanja: 金在中; born January 26, 1986), also known mononymously as Jaejoong, is a South Korean singer, songwriter, actor, director and designer. He is best known as a member of the Korean pop group JYJ, and was one of the original members of boy band TVXQ. 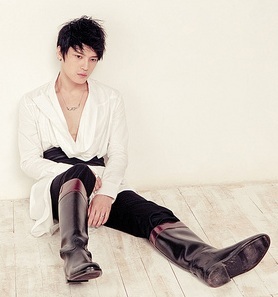 Kim was also known by the stage names Hero Jaejoong (in South Korea), Jejung (ジェジュン) (in Japan), and 英雄在中 (영웅재중) (in China). Kim is now using Kim Jae-joong (JYJ) for his activities. Kim has branched out to act in TV dramas including Sunao ni Narenakute, Protect the Boss, Dr. Jin, Triangle, SPY and most recently Manhole; and in films such as Heaven's Postman and Jackal is Coming. He was also the Executive Director for JYJ's 2011 Worldwide Tour and the 2011 LG Whisen Rhythmic All Stars. In January 2013 he released his first EP, titled I, followed by a full-length album, WWW in October the same year. Jaejoong has always been known to be caring and protective of s, the so-called Umma. And if he can get protective and caring of his friends we can only imagine how he would behave towards his very own lover, especially if said lover choose to hide some sensitive information. That only means Jae will have to implement a not so common set of skills, all in the name of love of course. Jaejoong's life has always been plain boring and simple, but what will happen if he encounter a handsome and arrogant rich man named Jung Yunho? Will love blossom between two people who started in a wrong way?